It’s a new year and we have a new reading challenge at our house. Last year we initiated a reading challenge for our 3 oldest kids (who were ages 10, 8, and 6). It was the absolute best idea ever! My kids read so many books! And their reading abilities have soared. They each read for 20 minutes a day every day. It became a habit and part of our daily routine. They exchanged books, shared stories with each other, and encouraged each other to keep reading. Yes, there were some prizes involved. After a few months I stopped hearing complaints about reading time. There was some complaining in those first few months but no longer! Now they look forward to their reading time with new books that they helped choose. I find them curled up in various chairs with their newest book. It brings such joy to my literature-loving heart! If you do the math, they have read for over 7,000 minutes this past year. This means that over 100 hours were spent with their noses in a book. Wow! As the new year rolled around they asked if we were going to continue the reading challenge. I think they were slightly hopeful that I would let them off the hook after their year of daily reading. Nope, no way! We’ve made too much progress and we’re not quitting now. However, I thought we should probably change up the challenge slightly. So rather than simply reading a book of their choice for 20 minutes every day, each month has a different theme. They have to read a book based on that theme or genre by the end of the month. Of course, they can also read other books, but at least one book must fit the theme. If all 3 children complete the challenge for the month they earn $20 collectively. However, we’ve added a little something else new this year. There is a chance to earn a bonus $5 collectively. To earn the extra money they have to complete a project based on one of the books. They have to work together to choose which child’s book will be the inspiration for the project. Then they have to decide on the project based on the list of ideas that I provide for them. It will be interesting to see how well they work together to create their projects, and I’m excited to learn more about the books that they’ve read for the month. 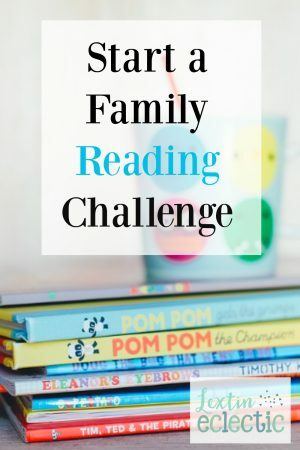 Have your kids participated in a reading challenge before? How have you challenged them to become readers?